Once in a great while, I attend a tasting that is so powerful it reshapes the way I view the world of Rioja. In this case it was a recent vertical tasting of Basilio Izquierdo’s best vintages, both from his tenure as head winemaker at CVNE for 32 years and from his personal project at Bodegas Águila Real where he makes a red and white under the label ‘B de Basilio’. The tasting was held in honor of Basilio’s classmates at the University of Bordeaux School of Enology Michel Douence, his wife Dany and Michel Rolland. All studied together in the 1960s, but took very different career paths, with Basilio going to work at CVNE, Michel at a big distillery in the Bordeaux area, Dany as the winemaker at the family winery Château Peneau in Bordeaux and Michel as the most famous flying winemaker in the world. It was a tour de force of Basilio’s prodigious talent as a winemaker, as he clearly wanted to show his former classmates and friends what he and Rioja were capable of. Basilio is probably the most unassuming man I’ve ever met. There’s not a bad bone in his body. In fact, he’s almost embarrassed to push his wines to potential customers. We have to work on that, as the ‘B’ wines are clearly several cuts above the average Rioja produced today. And, when he was at CVNE he was responsible for the great vintages of the 70s, 80s and 90s. The tasting was held at the Hostería Los Parajes in Laguardia. The wines came from Basilio’s private cellar. It started with two flights of the ‘B’ range, six whites (2005, 2007, 2008, 2009, 2010 and 2011) made from white garnacha (2/3), viura and malvasía, followed by five vintages of the ‘B’ red (2007, 2008, 2009, 2010 and 2011). Michel Rolland said he preferred to taste the wines from oldest to youngest, not a typical way to taste but it worked out fine. I was disappointed that the whites were served too cold. We spent most of the time warming up the glasses in our hands and some of them never really opened up. We were also pitifully short on glassware so it wasn’t possible to taste through all the wines again after half an hour in the glass. 2005: straw yellow – the only wine in the range with this color. Basilio said that he used cork here rather than a glass stopper. Honey and camomile on the nose, long and unctuous, almost sherry-like. Totally different from the other wines. Very good (but most people would dismiss the wine as oxidized). 2007: pale yellow. At first, not expressive, but after a few minutes opened up with delicate floral notes. I tasted licorice on the palate. 2008: pale yellow but more intense than the 2007. Still closed but opening up to wildflowers – more expressive than the 2007. Good level of acidity, a mouthful! My favorite wine of the flight. 2009: very pale yellow with a greenish tint. Served too cold to really appreciate at first but opens up to reveal licorice notes. 2010: very pale yellow. Herbaceous nose but also reminding me of overripe grapes. Nose very different from the rest. Unctuous, mouthfilling. 2011: very pale yellow. Delicate fruity nose. Too cold. Reds: (2/3 tempranillo and 1/3 garnacha with a little graciano). Basilio bucks the current single varietal trend in Rioja by insisting on using some garnacha, which he thinks should be a part of every Rioja. 2007: Medium intense ruby, with a little brick on the rim. Fresh strawberries, oak behind. Crisp acidity and firm tannins. A wine with a long life ahead of it. 2008: Medium intense ruby. Raspberries, less oaky than the 2007. Well put together, fresh and grapey. Vibrant acidity and firm tannins. Ready to drink but with plenty of aging potential. 2009: Medium-high intense ruby. Fresh, grapey aroma of red fruit. Oak behind. More aggressive tannin than the previous two vintages. Needs more time in the bottle. 2010 (barrel sample): purple/ruby. Oak stands out in front of the intense red fruit. Unpolished in the mouth. Needs more time in bottle but will be a fantastic wine in a few years. 2011 (tank sample): Intense purple. A huge explosion of fresh fruit both on the nose and on the palate. My favorite wines for drinking now were the 2007 and 2008. The 2009 is hard to judge but the 2010 and 2011 vintages hold great promise in my opinion. Imperial reserva 1999 (Basilio reminded us that it was the ‘400 pesetas/kilo’ vintage (grape prices went up drastically because of a small harvest and growers bid wineries against one another for grapes – something the wineries remind growers about the last several years). A huge color difference with the ‘B’ reds: light brick. Elegant, spicy, a little clove. Fine, round, feminine. Imperial reserva 1995: Light brick. Strawberry jam, small dose of spiciness. Round, silky, perfectly balanced. Viña Real Oro gran reserva 1994: (Note: The Viña Real line is made with a higher percentage of Alavesa grapes than the Imperial, made mainly with grapes from Rioja Alta). Light brick with an orange rim. Nose was flawed – I thought it might have been a dirty barrel because the aroma didn’t improve with time. Imperial gran reserva 1989: Light brick with some orange. Silky strawberry jam and orange marmalade. I thought it was past its prime. Imperial gran reserva 1982: More intense brick than the 1989. Elegant stewed strawberries on the nose. Elegant tannins with good ‘grip’. Perfectly balanced. One of my favorites. Imperial gran reserva 1978: light brick with an orange rim. Delicate, a little ‘pruney’. Good grip and balance. I wonder if it’s going to get better – now it seems to be at the apogee of the aging curve. I love this wine’s delicacy. Imperial gran reserva 1970: Light brick with a slightly orange rim. Quite intense spicy stewed strawberries. Good grip, elegant, perfectly balanced. Drinking very well. My favorite wine in the tasting. Viña Real Oro magnum with a blend of 1948, 1950 and 1952: Light brick/orange. Bottle reduction on the nose which disappeared after ten minutes revealing a delicate strawberry jam nose. Past its prime in my opinion (but I liked it because it was the oldest Rioja I had ever tasted). The Imperial/Viña Real wines impressed me enormously and reminded me of the style of Rioja prevalent when I joined the wine business almost forty years ago, with delicate, elegant soft red fruit wrapped in notes of cedar, cigar box and cloves. These are the wines that made Rioja famous. I wish more Riojas were made like that today but I’m afraid this will never happen (with the exception of the López de Heredia wines, in whose cellars time seems to have stopped) because used barrels, however well-maintained, are an anathema to the young Riojan winemaker, who has to deal with a warmer growing season (and consequently higher alcohol), taming wines vinified in new oak and unwilling or unable to add garnacha and graciano because of their unavailability and problems to vinify. This entry was posted in Events, Personalities, Some history lessons and tagged Basilio Izquierdo, Bodegas Águila Real, CVNE, traditional Rioja by insiderioja. Bookmark the permalink. His B de Basilio Blanco may be the best white wine I have ever tasted in La Rioja with the possible exception of some of the old Lopez de Heredia Tondonia Blancos such as the 1964. My only druthers with the B. de Basilio wines is the alcohol levels, which I wish were lower. As to the young wine writer in London who did not understand these wines, few, very few, who were not raised (in their wine lives) with these glories, will ever understand these wines or for that matter, get an opportunity to drink them ever again. For years, I put these wines on the highest pedestal and still do the greatest ones such as the 1942 V. Real, 1942 V. Bosconia, 1945 Marques de Riscal (as great as any European wine of that monumental year), 1947 Bosconia (the greatest red wine I have ever drunk [on four occasions]), 1952 Monte Real, 1962 V. Real (I still have a bottle, let’s drink it), 1964 Monte Real (I still have a bottle or two), believe it or not several 1973s, including Monte Real, Riscal, Muga Prado Enea and a few other ’73s from bodegas who timed the harvest right that year. 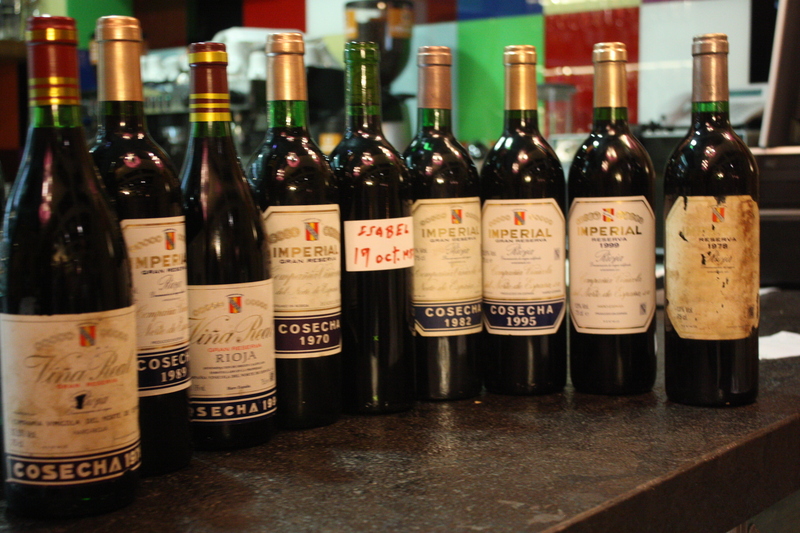 There were some stunning wines in the under-heralded 1981 vintage, including Cune Imperial and Cune V. Real, Monte Real (and Albina, if I remember correctly) and the truly great Prado Enea 1981, which is the first non-archived wine I ever scored 100 points in an article. I have never been a fan of the legendary 1970s for a couple of reasons: 1) I have never been privileged enough to have had a great one; 2) I am convinced that the cosecha, which coincided with a boom in investment in La Rioja, was so ballyhooed that every winery that could get their hands on grapes took advantage of the publicity surrounding the vintage and made as much wine as possible. That is something that mediocre wineries continue to do, make as much wine as possible in a highly rated vintage, because they know that the average wine drinker slavishly follows vintage years instead of following great producers. Un abrazo fuerte and thanks for looking after my friends, George and Stephanie Faison, in sanfermines. Dear Gerry, Many thanks for your insightful comments. You certainly have a wealth of experience with old Riojas from the 60s and earlier that I am lacking. I’m sure you will retest all the really old vintages at the end of the month (see – I know more than you think!!! ).